Sports Direct are not only the UK’s leading sports retailer by revenue and operating profit, but also the owner of a significant number of world famous sport, fashion and lifestyle brands. Currently operating c. 420 sports stores in the UK alone, c. 270 stores in 19 European countries, and their strategy is to expand into all major EEA countries over the next 3 - 5 years. During checkout at the payment page select ‘Use Gift Card/eVoucher’, enter your Card Number and Pin to redeem. Print this voucher and present at the till when paying for your items. 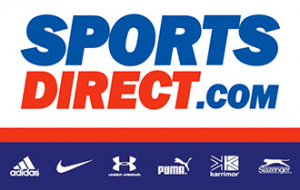 Gift Cards can be redeemed by UK customers online at SportsDirect.com and in branches of SportsDirect.com (locations in the United Kingdom only). Gift Cards may be exchanged for goods of a higher price than the value stored on the card on payment of the difference. If you do not spend the entire balance on the Gift Card the remaining balance will be stored on the Gift Card. No cash change will be given. Gift Cards may not be refunded, exchanged for cash, used as payment with discount vouchers or taken as deposits. Please treat Gift Cards as cash, we will not accept liability for lost, stolen or damaged cards. Gift Cards are valid for 24 months after purchase. Any remaining balance will be cancelled on the expiry of the validity period.